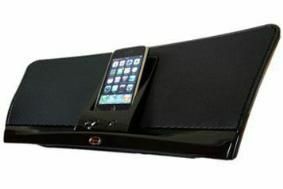 Klipsch iGroove HG gets iPhone/Touch compatibility | What Hi-Fi? The new 2009 model has 5-volt charging which enables it to play back from and charge the iPhone 3G/3GS, iPod Touch 2G/3G, iPod nano 4G/5G and all previous dockable iPods and iPhones. You can identify the 2009 version by its glossy black finish. It comes with special iPod nano and iPod mini adapters for secure docking, and the Shuffle can also be connected to it using the included J-cup adaptor. Other non-Apple MP3 players can be hooked up via the 3.5mm mini jack. There's full remote control of the system, which is equipped with dual 2.5in woofers, crossovers and dual 1in MicroTractrix Horn-loaded tweeters. The HG model provides "improved acoustic peformance through an increase in dynamic range," claims Klipsch. Deeper bass is provided by the port on the back of the cabinet. Klipsch's iGroove HG is available now from the Klipsch website, Amazon and other leading retailers.